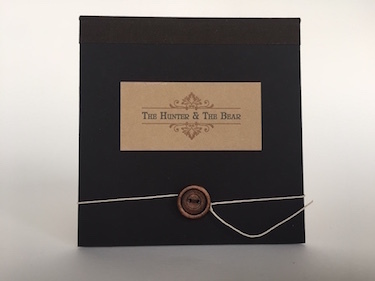 This book tells a fairytale-like story of a hunter and a bear. The hunter, along with six helpers, heads into the mountains to kill a fearsome beast of legend, an extremely large bear. What he finds is something deeper, when he falls in love with his prey. Unfortunately the bonds of love are not strong enough to overpower the two lovers’ basic natures. There is a betrayal, a scuffle, and the story ends when the bear eats the hunter and all six of his men. 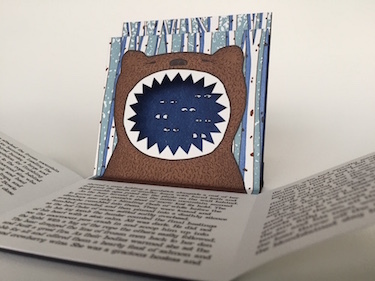 This book has a pop-up illustration with a tipped-in storybook. 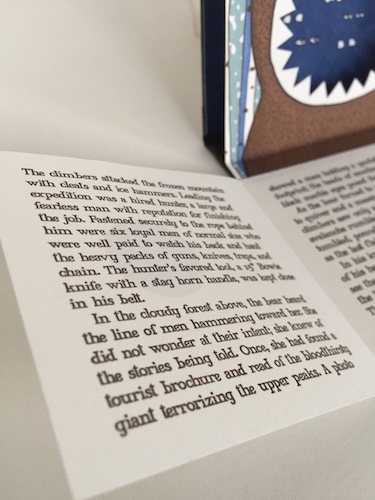 The illustration is letterpress printed in multiple colors. Bryan Kring originally wanted to be a writer but moved on to painting when he found that he didn't have any stories to tell. Kring went to art school and filled his home with large canvases. When there was no room left he switched to printmaking and working with small bits of paper. 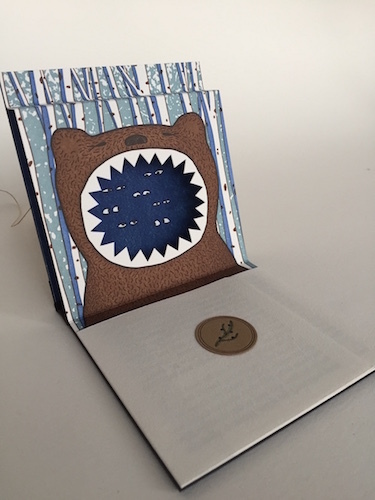 Now, after finding a few stories, he is working in book arts and am able to do a little of everything and is enjoying connecting the circle back to the writing. Bryan Kring is also a graphic designer and runs the creative firm Kring Design Studio.